I’m heading out on another European adventure this Summer. First stop: Rome. This will be my first time visiting the Eternal City and while I imagine the Sistine Chapel is really impressive, I’m mostly looking forward to dining out on really real Italian food. Everybody I know is telling me that I have to try cacio e pepe while I’m there. 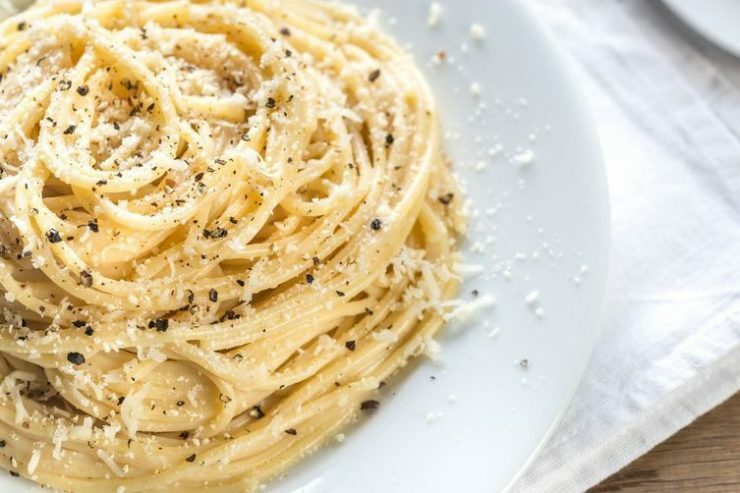 Cacio e pepe, literally translating to ‘cheese and pepper’, is standard Roman fare, and if the name is any indication, it sounds like it’s as close to perfection as food can get because, well, cheese and pepper. Anyway, I scoured the internet for a recipe that I could prepare at home so that I when I try it in Rome, I can slowly lean back at the table, loosen my jeans button, and arrogantly say, “the cacio e pepe I make at home is waaaayyyyy better.” #petty. So, I found this amazing recipe from the fine folks at Food52, and I’m pretty confident that this dish will hold up against any cacio e pepe I order in Rome. For real, this recipe is real life weeknight dinner goals. You must try this! In a pot over low heat, heat the crushed peppercorn with the olive oil. In a pot large enough to cook the spaghetti, bring water to a boil. Turn the heat off under the olive oil and add about 1/2 cup of the hot cooking water from the pot into the pan, then set aside. When the pasta water comes to a rolling boil, add the salt, stir, then add the spaghetti. Cook the spaghetti until 2 minutes under the lowest time recommended on the package. Using tongs (you don’t want to get the rid of the water), add the pasta to the pot with the pepper. Turn the heat onto very low and turn the pasta continuously until most of the water is absorbed. At this point, remove from the heat and transfer to a warm bowl. Still tossing, begin adding the two grated cheeses, a couple handfuls at a time. If it starts to get dry, add 2 to 3 tablespoons of pasta water. Keep turning and turning, adding cheese and pasta water, a little at a time, until all the cheese has been incorporated and you have a lovely creamy sauce coating each strand of pasta. Eat immediately.